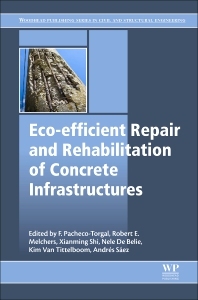 Eco-efficient Repair and Rehabilitation of Concrete Infrastructures provides an updated state-of-the-art review on eco-efficient repair and rehabilitation of concrete infrastructure. The first section focuses on deterioration assessment methods, and includes chapters on stress wave assessment, ground-penetrating radar, monitoring of corrosion, SHM using acoustic emission and optical fiber sensors. Other sections discuss the development and application of several new innovative repair and rehabilitation materials, including geopolymer concrete, sulfoaluminate cement-based concrete, engineered cementitious composites (ECC) based concrete, bacteria-based concrete, concrete with encapsulated polyurethane, and concrete with super absorbent polymer (SAPs), amongst other topics. Final sections focus on crucial design aspects, such as quality control, including lifecycle and cost analysis with several related case studies on repair and rehabilitation. The book will be an essential reference resource for materials scientists, civil and structural engineers, architects, structural designers and contractors working in the construction industry.